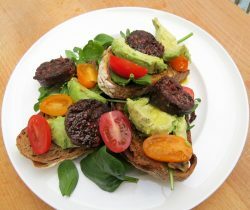 Avocado and Vegetarian Black Pudding on Sourdough Toast another amazing recipe from Our Lizzy. A quick tasty dish – perfect for lunch. Toast the bread, top with mixed leaves, slices of avocado and tomato. Heat some olive oil in a small frying pan. When the oil is hot, add some chopped V Pud and cook on both sides. Place on top of the toast. Season well, drizzle with extra virgin olive oil and serve.